Getting Around – To drive or to fly? Traditional safaris in Uganda are guided tours in a 4×4, driven by a professional safari guide. We feel this is still the best way to really immerse yourself in the country, however there are now other options available, giving travellers more flexibility in terms of time-frames and budget. In the last few years we have seen the introduction of both affordable internal flights as well as reliable rental vehicles. For those on shorter time frames, flying cuts lengthy drives out of a trip, especially to Bwindi Forest for Gorilla Trekking. Self-drive in a rental vehicle is now a viable option, an excellent way to save on costs. We provide all support equipment and safety briefings if you decide to choose this option. There are advantages to each of these three transport modes; Self-Drive, Guided and Flying, here’s a short overview. 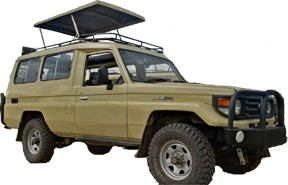 Our guided safaris are driven in a Toyota LandCruiser (or similar) 4 x 4 safari vehicle. This is a real African safari experience, the soft growl of the resilient diesel engine and the feel of the undulating terrain under the tyres. 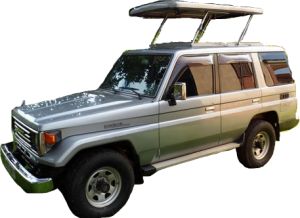 The vehicle will be driven by your very own experienced and knowledgeable safari guide, whose insights on the country, people and wildlife will enhance your journey in Uganda. Travelling the country by car you have the consistency of travelling with the same guide who can relate a sighting back to a conversation days prior. You’ll also have the excitement of entering the National Parks by vehicle. A safari drive does not have to be a scheduled excursion and some of the best sightings can be the most unexpected! Driving yourself is a real adventure. There are safety precautions to be aware of and Uganda is not as well sign-posted as other countries, however with the right support and resources this can be a fun and rewarding experience and an excellent way to reduce the costs of your holiday. All of our self-drive trips include a smart-phone loaded with airtime, data and google maps, as well as contact phone numbers for each lodge and other useful numbers! We’ll also give you a detailed road-map of the country with a suggested route marked on it in addition to driving directions. For some people the occasional lengthy journey in a car can be off-putting. Even the best planned trip in Uganda may still involve the odd 5-6 hour day in a car. If you love a road-trip then these journeys are often a collage of interesting vistas, unique sights (i.e. a cow on a motorbike!) and delightful roadside stops for lunch or curio shopping. However if long drives are not your thing please let us know! Uganda’s internal flight network certainly trims time from your itinerary, especially if you wish to travel to the South-West (Bwindi, Queen Elizabeth and Kibale). Twice daily flights service this region in comfortable 12-seater Cessna aircraft based out of Entebbe International Airport. Flights are scheduled to Murchison Falls and Kidepo National Park, although these are not daily and sometimes subject to minimum passenger numbers to operate. A flight certainly gives you a different perspective of the country, the light-aircraft flying low enough that on a clear day you’ll see stunning vistas such as Lake Victoria, The Rwenzori Mountains or Murchison Falls. If you are flying you’ll land at a reasonably remote airstrip and we will organise the lodge at which you are staying to have a representative and vehicle waiting for you on arrival. There is also a charter service whom we can arrange to fly you anywhere at any time. While convenient and totally exclusive, this option is a little more costly. It all depends on your trip, time and preferences as to what is “better” of the two above options. A trip for 2 from Entebbe to see the Gorillas and back can actually be cheaper by aircraft, where a longer trip with a larger group will be more much more economical by car. A combination of both modes such as in this sample itinerary can be a good balance of experiencing the country but also making the most of your time away. When planning your trip we can present you with different options for you to choose from.